For other uses, see Holon (disambiguation). 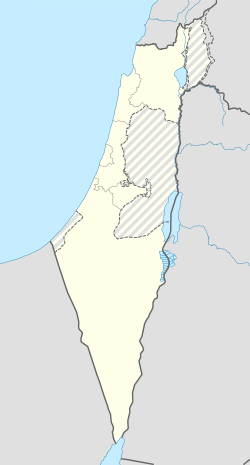 Holon (Hebrew: חוֹלוֹן (audio) (help·info); Arabic: حُولُون‎ Ḥūlūn) is a city on the central coastal strip south of Tel Aviv, Israel. Holon is part of the metropolitan Gush Dan area. In 2017 it had a population of 192,624. Holon has the second-largest industrial zone in Israel, after Haifa. The name of the city comes from the Hebrew word חוֹלוֹן holon, meaning "(little) sand". The name Holon also appears in the Bible: "And Holon with its suburbs, and Debir with its suburbs" (Book of Joshua, 21:15). Holon was founded on sand dunes six kilometers (3.7 miles) from Tel Aviv in 1935. The Łódzia textile factory was established there by Jewish immigrants from Łódź, Poland, along with many other industrial enterprises. In the early months of the 1948 Arab–Israeli War, Holon was on the front line, with constant shooting taking place on the border with the village of Tel A-Rish to its northwest—a suburb of Arab Jaffa—and clashes also in the direction of the town of Yazur to the east. An attack by the Holon-based Haganah militia units on Tel A-Rish was repulsed with considerable losses. After the establishment of the state, Holon expanded to include Tel A-Rish (renamed "Tel Giborim", "The Mound of the Heroes") and the orange groves of Yazur. In February 2001, eight Israelis were killed and twenty-five were injured in a Palestinian attack on a crowded bus stop in Holon. The image of Holon as a working-class bedroom community has changed over the years. Through municipal efforts, the city has been rebranded as a child-friendly city, offering family attractions such as the Yamit Water Park, the Israeli Children's Museum and the Israel Museum of Caricature and Comics. Historic landmarks in Holon slated for preservation include Derech Habitachon ("Safe Road"), paved during the Israeli war of independence; water towers in the Moledet and Azor neighborhoods; Hosmasa, a building used by the Haganah; the pillbox guard post; Stroma Square, Mansbach health clinic, Hameshakem building, the Agrobank neighborhood and two schools – Bialik and Shenkar. A new neighborhood, Migdalim Bashdera, is under construction, with plans for 23 upscale residential towers, a new city hall, several cultural and commercial centers, some of them already built. A French urban planner was commissioned to design a north-south boulevard with pedestrian walks, bicycle paths, sports fields, parks and waterfalls. The last undeveloped land reserve remaining in Holon is the H-500 Holon plan, that consists of approximately 4,080 dunams in the south of the city, and is intended to consist of 13,700 dwelling units in total. Holon hosts a variety of springtime events, including the Yemay Zemer (Days of Song) Festival during Passover and a Women's Festival in March, both at the Holon Theater. Holon is also one of the host cities for the Rhythmic Gymnastics Grand Prix Series in March. Israeli violinist Pinchas Zukerman runs a summer music camp in the city for young violinists. Since the election of Mayor Moti Sasson in 1993, many cultural projects have been inaugurated. Billing itself as a "children's city," Holon is home to the Holon Children's Museum and the Mediatheque youth theater. Holon also plays host each year to a street carnival in celebration of the Jewish holiday of Purim, the Adloyada. Thousands of children dress up in costumes and the streets close down for a parade featuring colorful floats. The Design Museum Holon, which opened in 2010 near the "Médiathèque" and the Faculty of Design of Holon Institute of Technology, is the first Israeli museum of design. In October 2013, Holon hosted major international designers who arrived for Holon Fashion Week (known as HoF13), among them milliner Stephen Jones and BioCouture founder Suzanne Lee. Cinematheque Holon hosts the only digital arts and media arts festival in Israel, Print Screen Festival. The festival was established 2010. 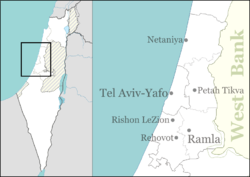 In 1954, the president of Israel, Yitzhak Ben-Zvi, helped to establish a Samaritan quarter on the outskirts of Holon. The quarter was named Neve Pinchas after Pinhas Ben-Abraham, the high priest of the Samaritan community. Holon is one of only two cities in the world to have a Samaritan community, the other being the village of Kiryat Luza on Mount Gerizim above Nablus on the West Bank. The Collège-Lycée franco-israélien Raymond Leven is located in Mikve, Holon. ^ "The Story of Holon:Making Sand Dunes Sophisticated". Isrealli.org. Archived from the original on February 28, 2011. Retrieved January 20, 2011. ^ "Victims of Palestinian Violence and Terrorism since September 2000". Mfa.gov.il. Archived from the original on April 3, 2007. Retrieved April 25, 2014. ^ a b Bassok, Moti (November 29, 2013). "Working class Holon aims to attract affluent home buyers". Haaretz. Retrieved April 25, 2014. ^ Aderet, Ofer (June 9, 2011). "Holon seeking to preserve 18 historic sites". Haaretz. Retrieved April 25, 2014. ^ "The Holon H-500 Information Arena". Joseph Raiten. Retrieved December 27, 2016. ^ a b "Haim Kugel". Holon City. Retrieved June 8, 2015. ^ "Pinhas Eylon". Holon City. Retrieved June 8, 2015. ^ "Festivals". Holon Municipality. Retrieved May 8, 2013. ^ "Israeli cultural scene explodes with dynamic music, fiction, art". Jweekly. June 5, 1998. Retrieved April 25, 2014. ^ "Post-championship Holon dreams of prosperity, tourism – Haaretz – Israel News". Haaretz. Retrieved May 5, 2009. ^ Handwerker, Haim (September 10, 2013). "Holon Fashion Week attracts big industry names". Haaretz. Retrieved April 25, 2014. ^ "Samaritans". Jewishmag.com. Retrieved May 5, 2009. ^ "La localisation." Collège-Lycée franco-israélien Raymond Leven. Retrieved on January 22, 2015. "Agricultural School Mikve Israel Mikve israel street 1 5891000 Holon – ISRAEL" – Address in Hebrew: "בה"ס חקלאי מקווה ישראל 5891000 חולון"
^ "Sister Cities International (SCI)". Sister-cities.org. Retrieved April 21, 2013. Wikimedia Commons has media related to Holon. Wikimedia Commons has media related to Holon Cemetery. Wikivoyage has a travel guide for Holon.